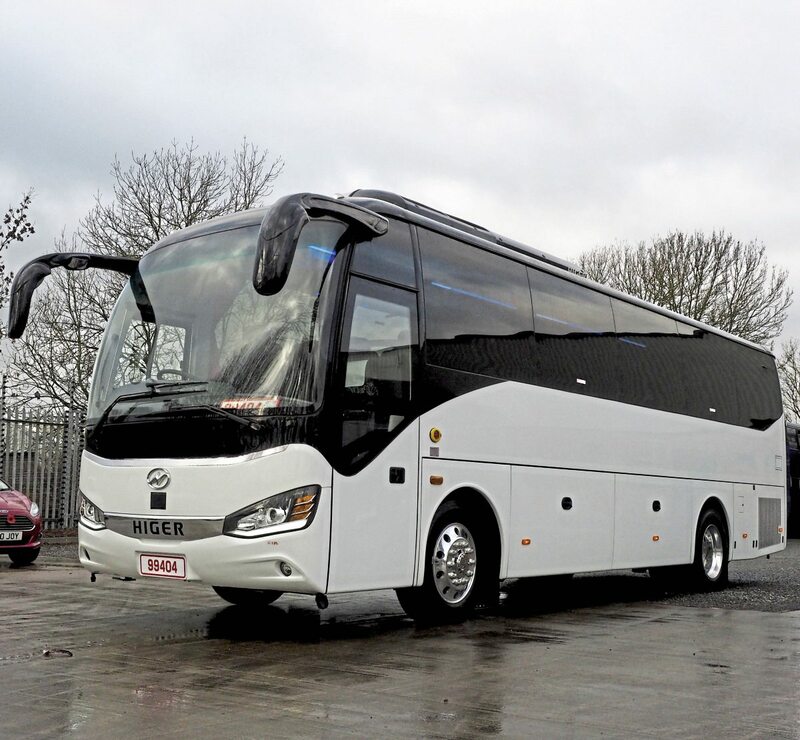 Higer’s Super 9 XL caught the attention during a roadshow staged by importer Harris Auto, and shows all the signs of being a serious contender in the midicoach sector. Bus and Coach Buyer gave it a spin. An operator I spoke to not so long ago has mixed feelings about running midicoaches. On the one hand, he said, they are popular and fill a niche. On the other, they’re not much cheaper to run than a full-sized coach. When you think about it, how do you explain to a hirer that the 39-seater isn’t two thirds the cost of the 57-seater? 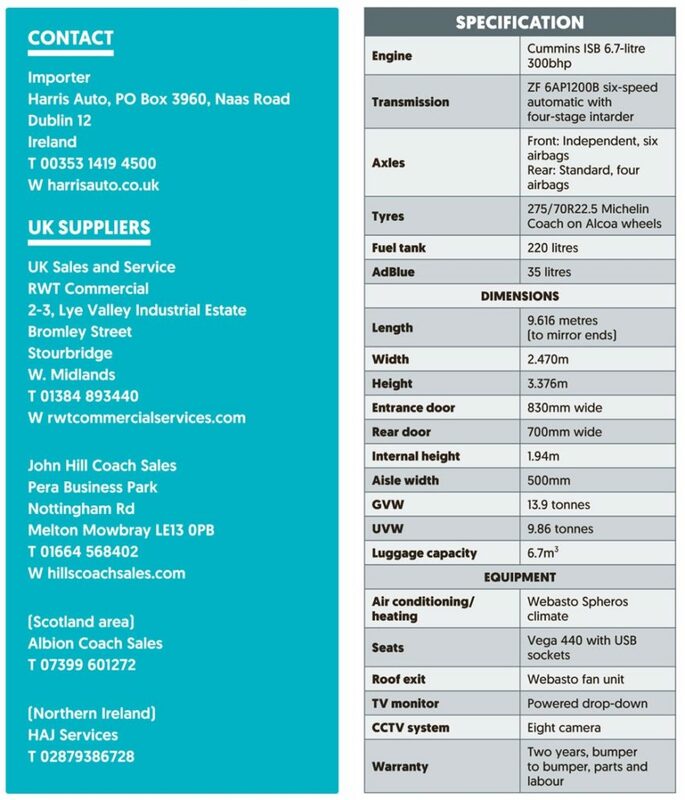 There is a difference in running costs between a rear-engined nine-metre coach and a 13-metre coach, but it’s not huge. It’s important to separate front-engined from rear-engined. 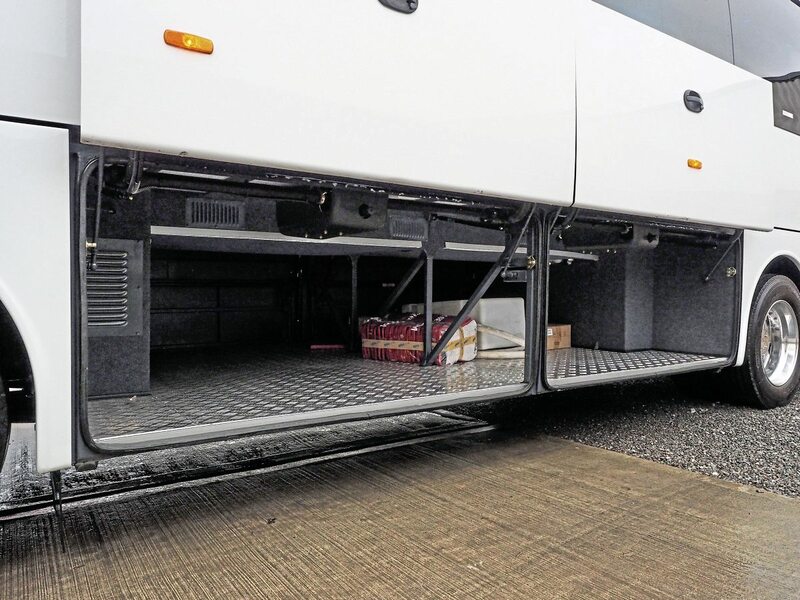 There’s no doubting the impressive economy in both fuel use and price of new, light-truck-based coachbuilts, but in the eyes of many operators, they’re not ‘proper coaches’ and, certainly, most compromise in some obvious areas. The first is that they rarely look like a ‘proper coach,’ often retaining features of the donor vehicle and often with gravity-defying rear overhang. In the second place, the engine in the front does compromise the front passenger entrance to some degree. In the third, engine noise intrusion is an issue; most recent examples make an impressive fist of noise reduction, but it’s still there. 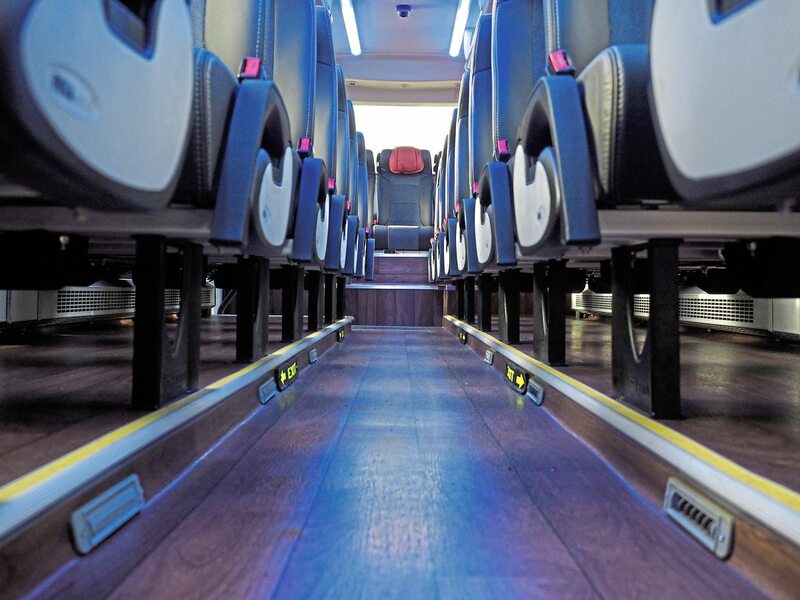 Short, rear-engined coaches are more appealing to most operators and, perhaps, passengers, but are not – indeed, cannot – be made significantly cheaper. After all, the only difference between a 10m and 13m coach is three metres of bodywork, seats and steel; both still have expensive stuff at the front and back. But the rear-engined midicoach market is still competitive, and entrants from China have in recent years spiced things up a little. 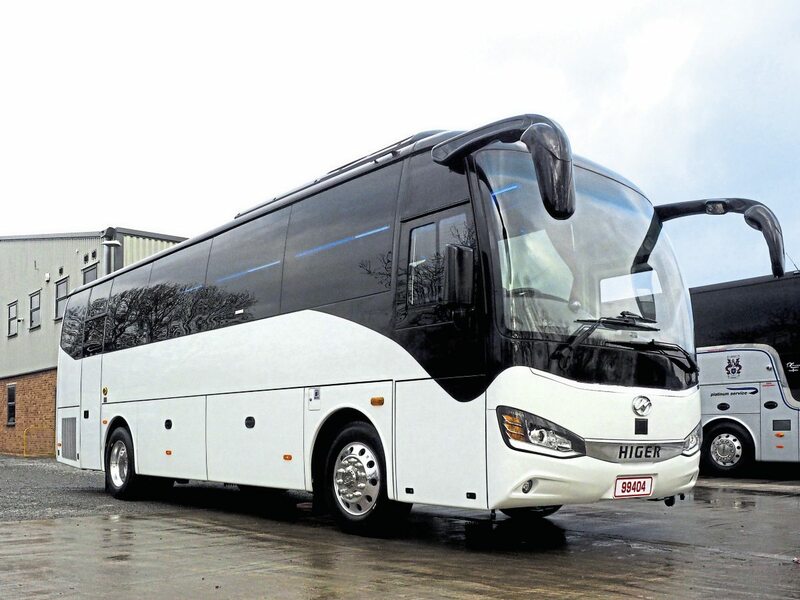 One of those is the Higer Super 9, the 9.6-metre coach imported by Harris Auto in Ireland and sold in the UK by Bob Turnock’s RWT Commercial Services as sales and service agent. It was launched a couple of years ago, then Harris cannily listened to prospective customers who saw it and drove it before tasking Higer to answer criticisms in many areas. 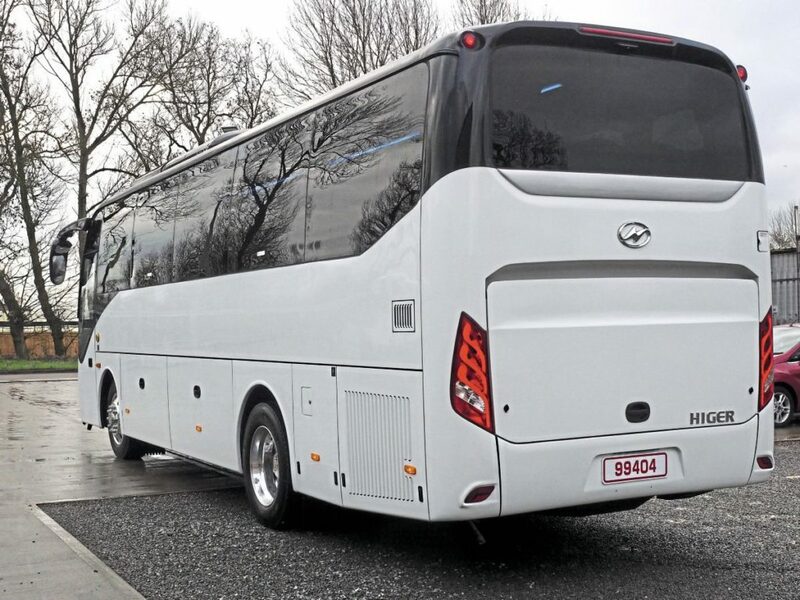 So what’s on sale now in the UK is, in effect, the Mk II, and the vehicle offered to us for test is the Super 9 XL – a touring version with 39 seats and an offside door. 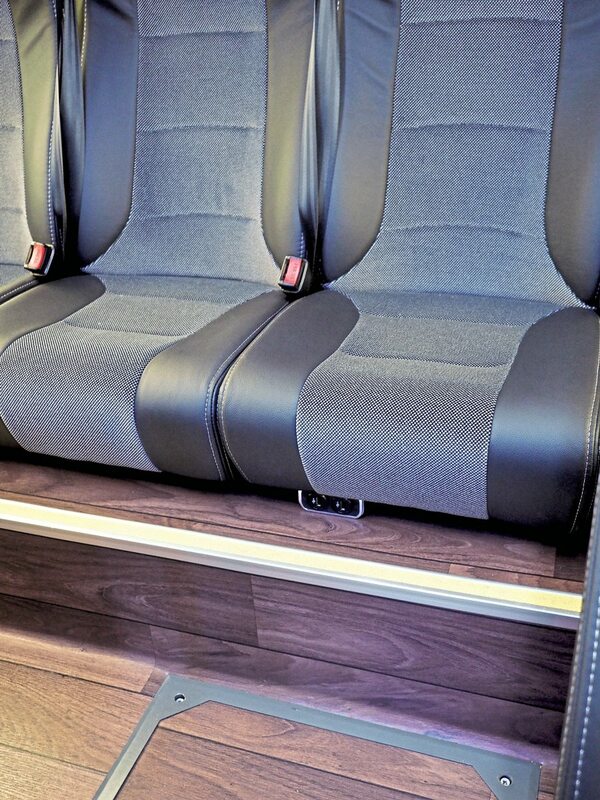 It comes with alloy wheels, powered lockers, USB sockets to every seat, and a raft of other extras. Bus and Coach Buyer’s anonymous road tester and myself travelled to John Hill Coach Sales in Melton Mowbray to start our test ride, as John is also demonstrating and selling the Super 9 in the UK. From the moment we arrived, it impressed. The Super9 XL is a very nice looking midicoach, without being showy. Any prejudice against perceived Far Eastern styling is dispelled by it, and it is nicely proportioned. 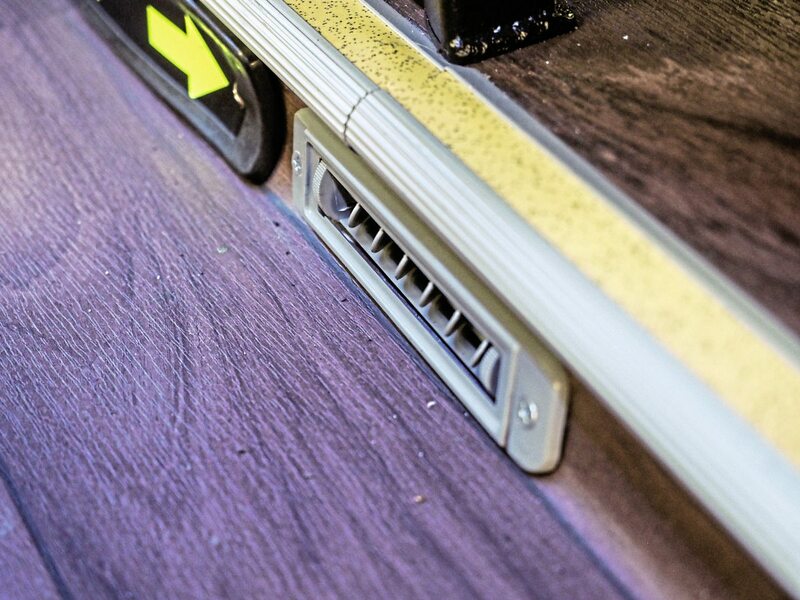 Starting on the offside, the coach has clean, flat panels perfect for vinyls. The use of glass is uncomplicated with the lower window line blended into a black-painted section which curves beneath the driver window to the front. The fuel filler flap is on the offside, the filler cap positioned a little high for our liking. Luggage bay is more than adequate. The windscreen is a complex curve which rakes back to the roofline. Beneath it, the mouldings are very smart, with no dimpling, and the design effective but, again, uncomplicated. 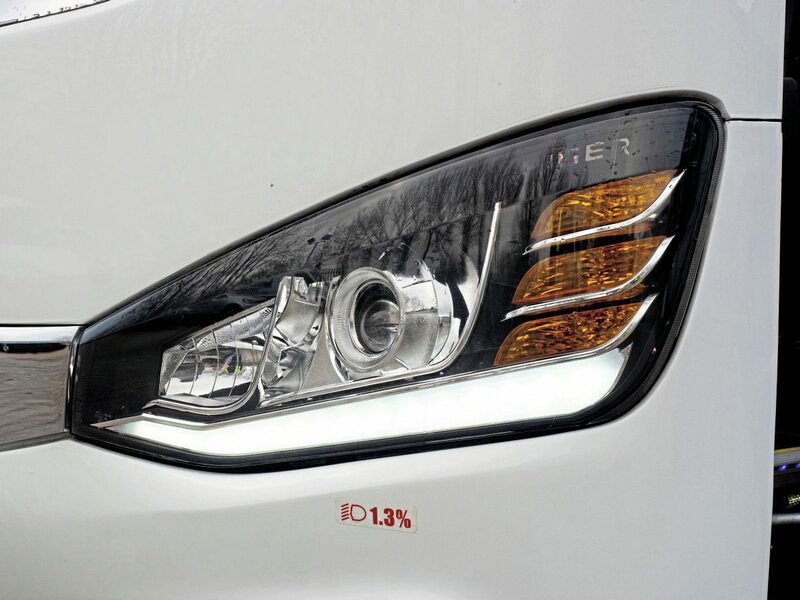 The combined headlamp/indicator clusters are attractive, with fog lights built into the lower valance. 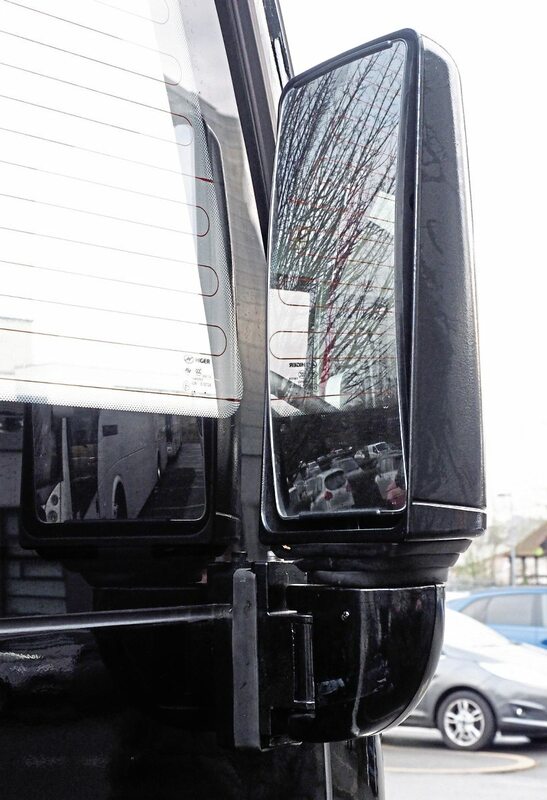 There are two mirror units, each of which have three mirrors; one of them gives a view of the front of the coach. 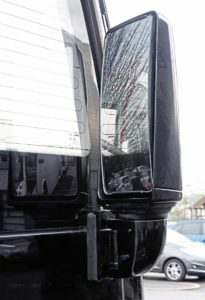 Additionally, the coach has a substantial driver mirror mounted on the A pillar near the driver window. 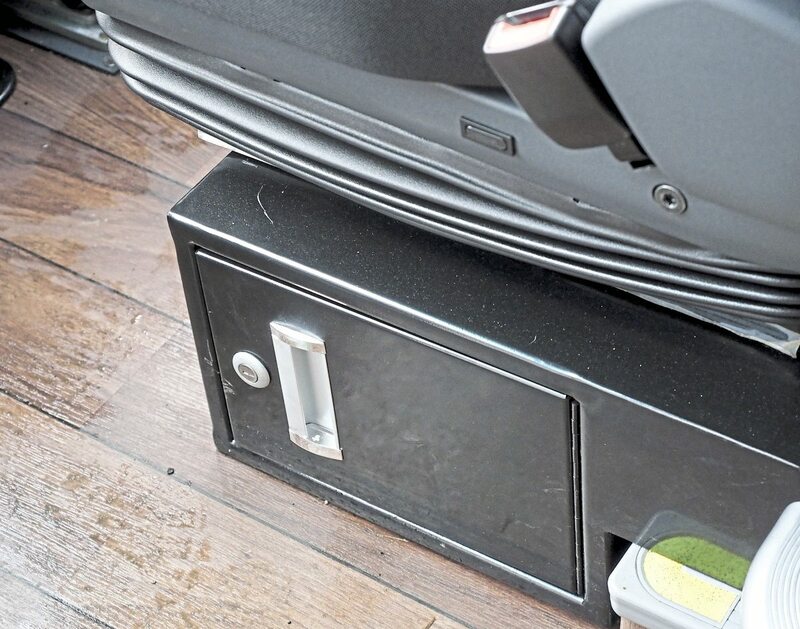 Two powered locker doors reveal an ample luggage bay. Service panels access the engine bay, and the cooling pack and AdBlue filler are on the nearside. At the rear, the styling is very attractive, with the rear window line continued into a raised panel, the engine bay cover beneath held in place with strong gas struts and twin locks. 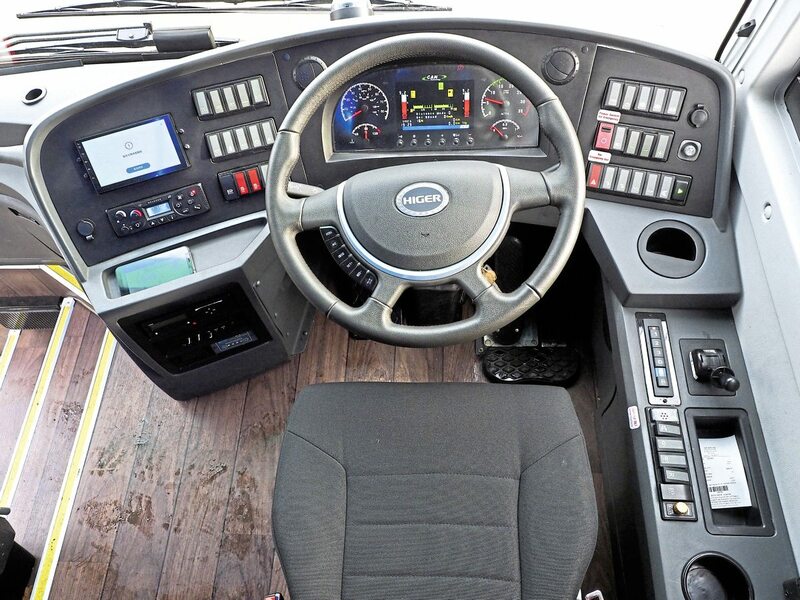 This coach has an engine bay fire system, activated by a safety-covered switch in the driver cab. 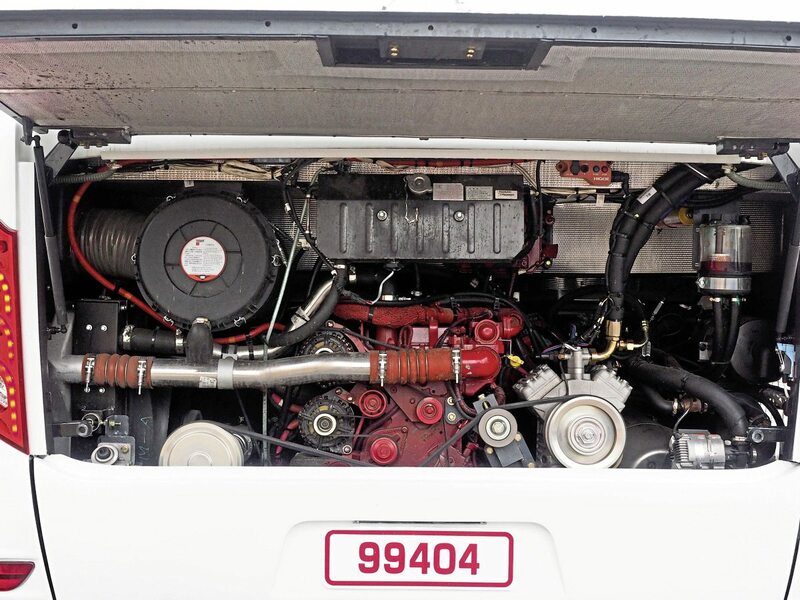 These engine bay fire systems are mandatory for coaches registered after June this year. 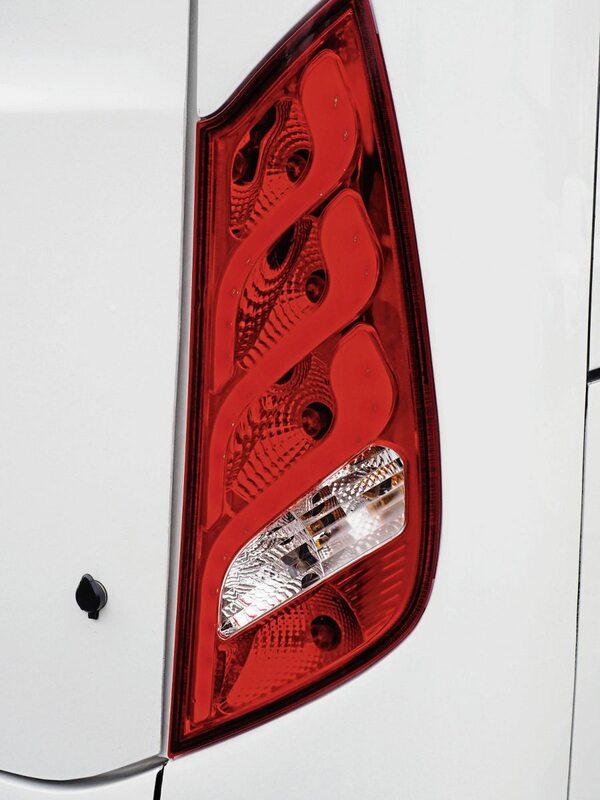 Higer has designed a very attractive rear light cluster. An oddity is the exterior fuel cut-out button hidden under a flap; this is no longer required to meet regulation in the UK, I am told. There’s also an Eagle Eye reversing camera, but perhaps due to some difficulty configuring the media display from its native Chinese, this was not tested. The Super 9 XL has a black-painted roof and this extends to the Webasto-sourced Spheros independent air conditioning/heating pod. One small but useful feature of the Super 9 XL are a skid block beneath the front nearside valance to prevent corner damage on high kerbs during kneeling, and pneumatic corner sensor on the other corner to warn of imminent collision with low-height obstacles. 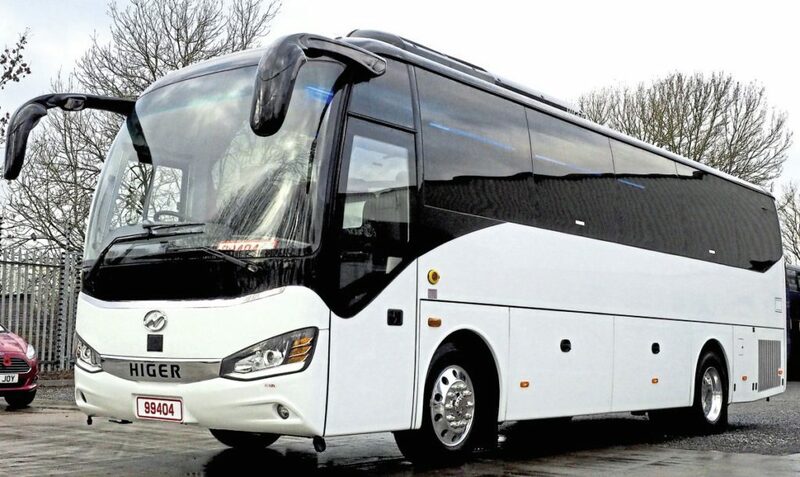 The Super 9 XL is, subjectively, a nice-looking coach, and the finish and shut gap consistency for all panels was very good, perhaps reflecting the maturity of this body styling in China, where a very similar coach is marketed as the Adventure. 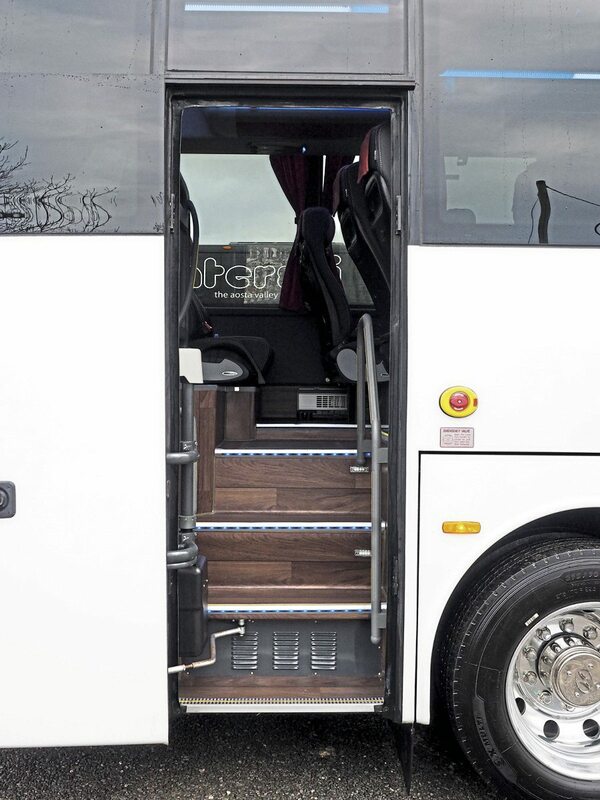 The passenger door is wide and leads to a very well structured, four-step entrance, with handrail to the left, courier seat to the right. In the stairwell, the courier has a curious, metal flip-up footrest; on our road test, this had a tendency to rattle. Passenger access is, though, excellent. Two very solid decency screens have grab rails. 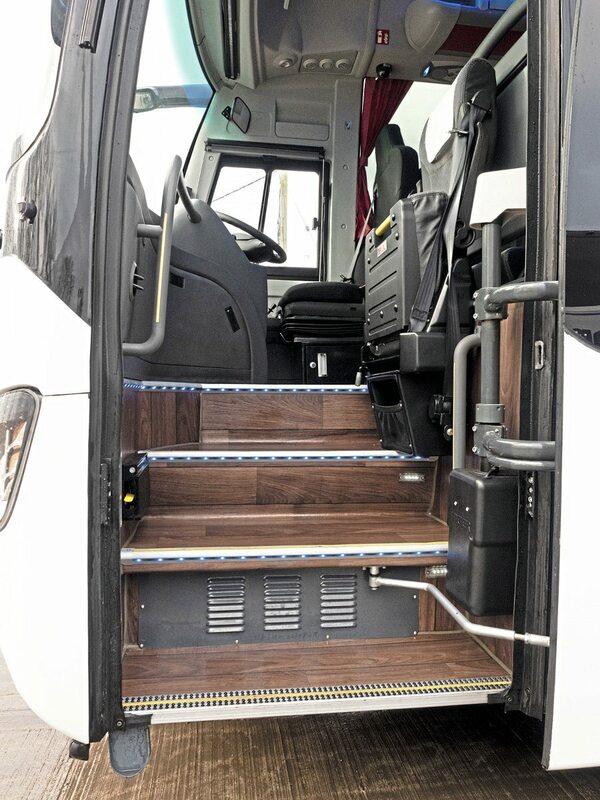 At the driver seat level, there’s a small additional step on to the sunken aisle, which with all the floor, is covered in a wood-effect flooring. The aisle itself is equipped with floor-level ventilation units which are, slightly oddly, adjustable, and ‘exit’ direction markers which weren’t a particularly good fit. Seats are very comfortable. The Vega seats have rather utilitarian plastic backs with bag hooks and handles. They have leather bolsters and headrests (which are secured with hook-and-loop) and a flat-weave fabric back and squab. Aisle seats have side-shift and armrests and all aside from the rear seats recline. Overhead, passengers have very nice service units and luggage racking. 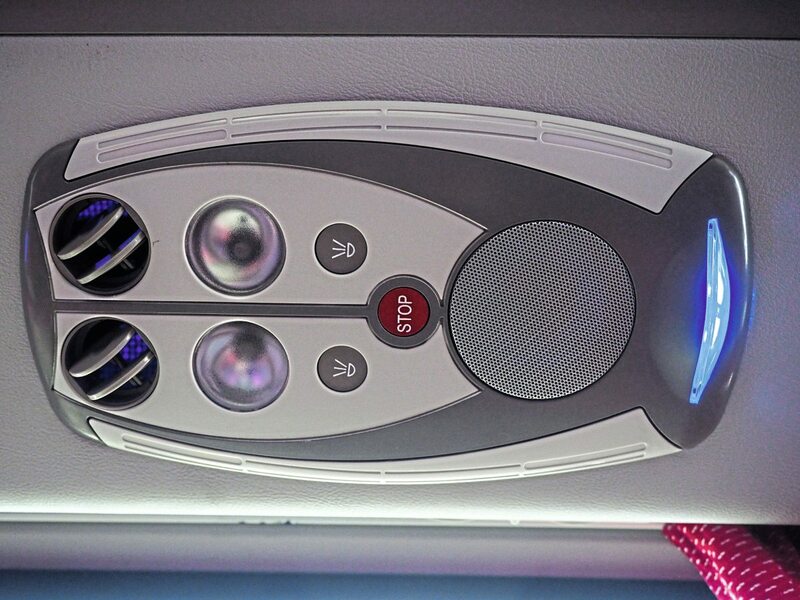 Higer has equipped the passenger saloon with a whole array of configurable LED lighting, which can be switched in three or four stages from blue mood lighting to white light. 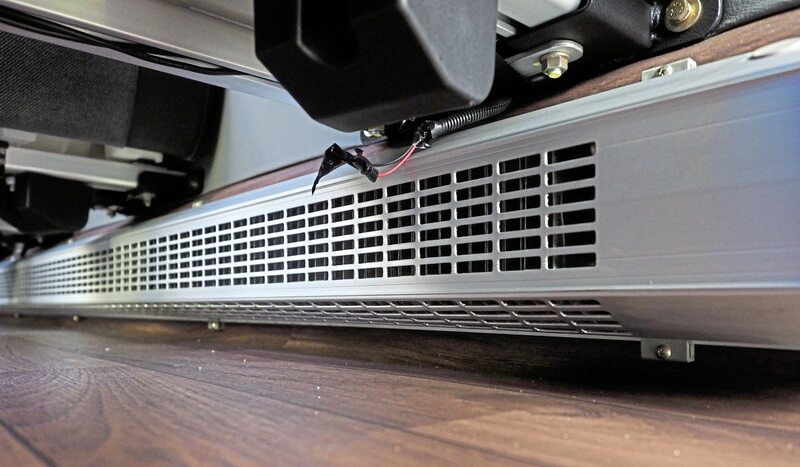 Running the length of the coach are convector heaters, raised above the flooring high enough to prevent the gap becoming a dirt trap. All the seats have USBs. Very sensibly, Higer has opted for twin USBs at the front of the seats which, though a little inaccessible, won’t get kicked or tempt small fingers to stuff them with chewing gum. The video monitor is a single, motorised drop-down unit at the front. 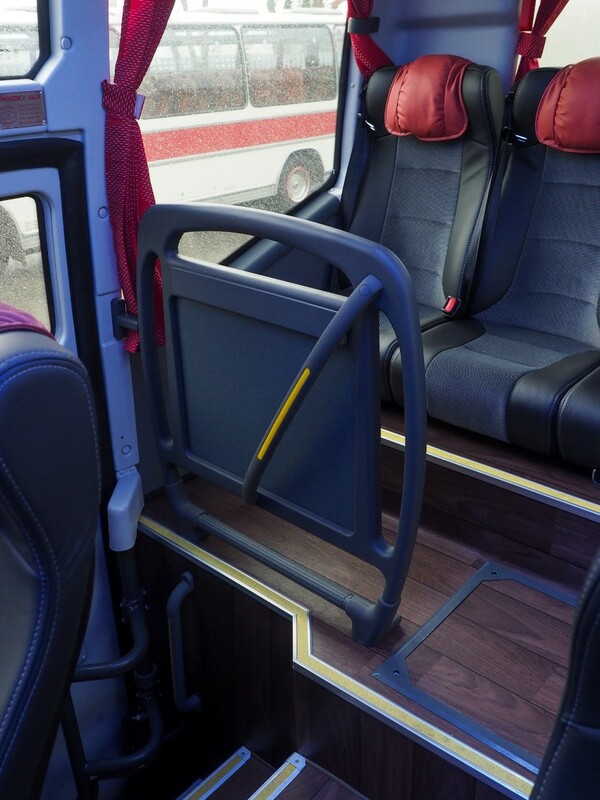 The rear seating area often displays the biggest compromises but Higer has done very well, the seats not too cramped though the step up to this raised seating is quite high; on the plus side, the raised seats (which have slightly lower backs) give a lovely forward view for passengers. One small issue was that the seats are set far back on their plinth to achieve good seat pitch on the nearside but this did mean that passengers with short legs may find their calves against the plinth. On the offside, another decency screen guards the rear stairwell to the offside passenger door. The steps are not overly steep so this is a practical option for continental touring, for example. 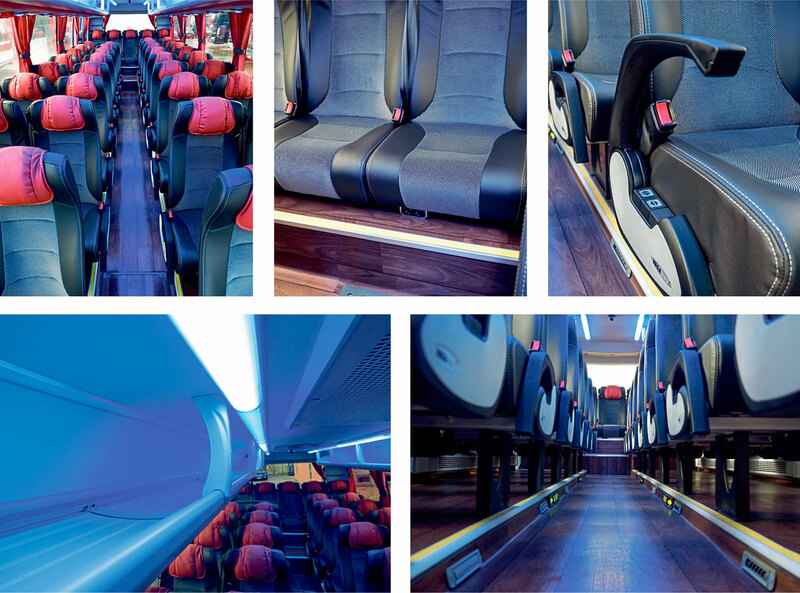 We road tested this coach on a very dull day but the passenger saloon was bright and felt airy. It’s a very pleasant travelling environment. 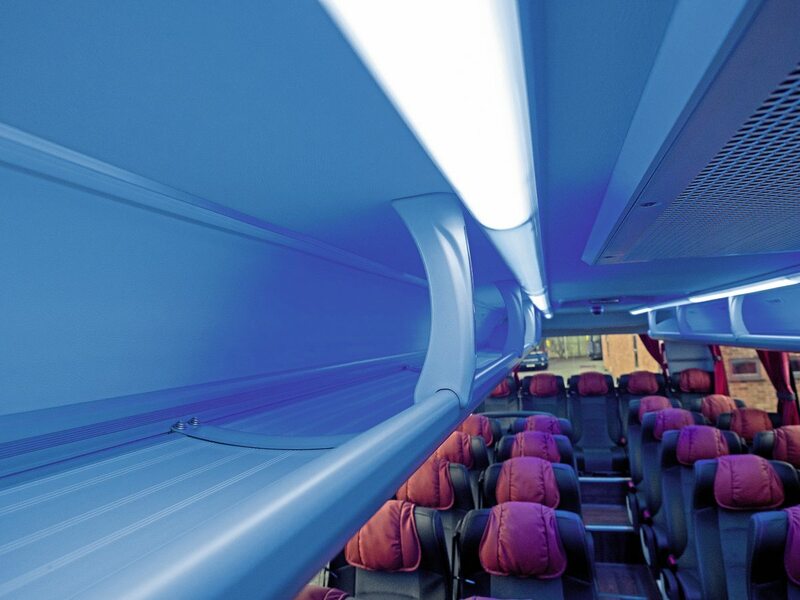 One other thing; in this 39-seater, the window frame uprights are perfectly positioned so no passenger will spend their journey looking at a pair of curtains. We’re told that the dashboard is due an upgrade to the mouldings, which we look forward to seeing; not because there’s anything wrong with it, but because revision will make it better. It’s already very good, ergonomically. 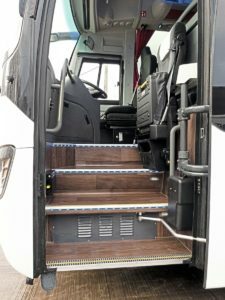 The driver has an Isri seat which sits fairly high, even at its lowest setting, and faces a fairly large steering wheel, on which are mounted the cruise control buttons and AEBS cancellation plus an engine diagnostics button. 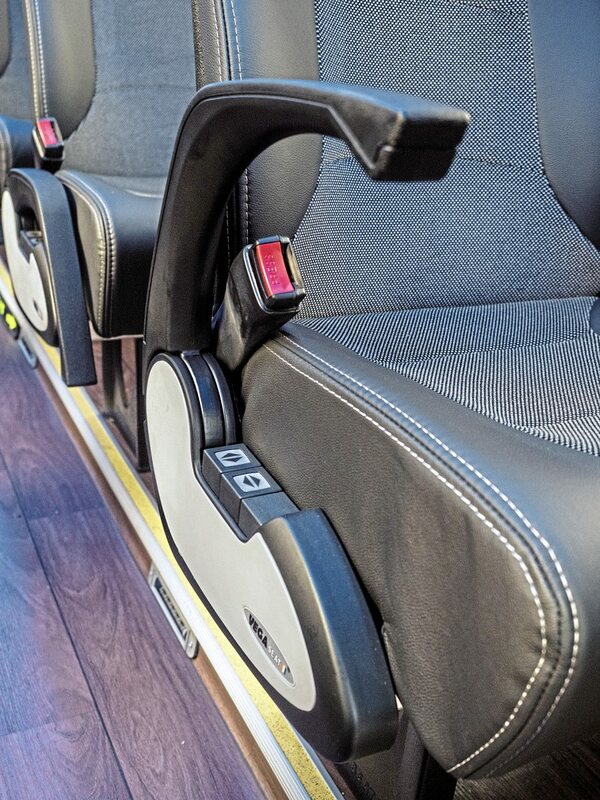 Our test driver said he would have preferred those controls to be somewhere less accessible, and unintentional deployment of the AEBS cancellation which triggered a continuous alarm confirmed his concerns. It’s one of those things drivers need to be aware of, but not a major problem. The switchgear is otherwise logically arranged, with main controls to the left, and saloon comfort controls to the right. The gearbox selector is a push-button system at the driver’s right hand, as is the handbrake. Here, also, is a selector for ‘Power’ and ‘Eco’ settings which control the gearchanges to gain economy or to provide extra oomph for tackling hills and the like. Not every operator will be on-board with this, preferring the economy setting as a default. However, being able to hold on to the lower gears a little longer does eke a little more acceleration out of the 300bhp Cummins engine and ZF EcoLife combination. Driver education would be the best bet because this extra power can be very useful on steep sliproads, for example. Our test driver said the view is exceptional and clear, the long-looking mirrors in clear view to make, in his opinion, the secondary driver mirror on the A pillar slightly superfluous. There’s an additional overhead mirror to monitor passengers, perfectly positioned and not, as some are, stuck to the windscreen. An eight-camera CCTV system with forward and interior views is standard. 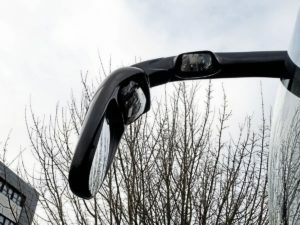 The windscreen, incidentally, is heated electrically – much the best solution for frosty mornings and, we are assured, priced surprisingly well should it be damaged. Harris – a very experienced truck supplier – has a huge stock of parts for the Super 9, with glass readily available throughout the UK. 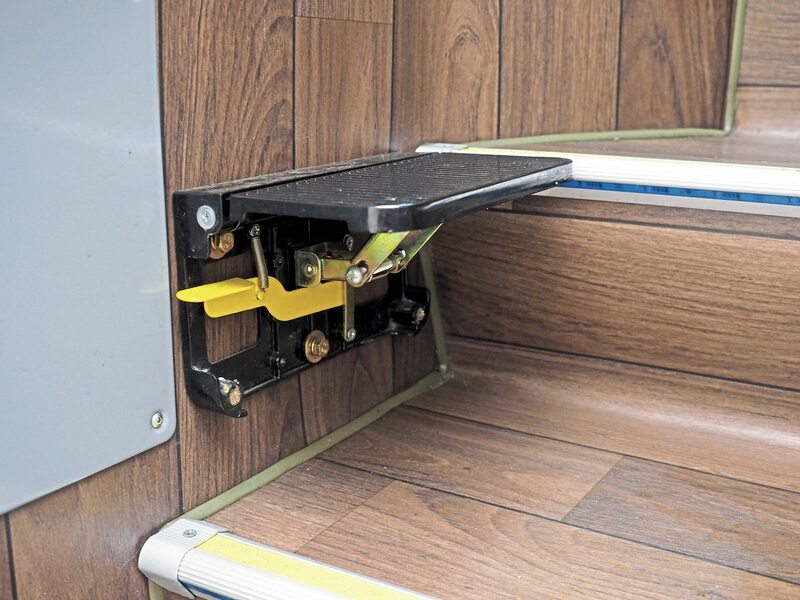 Under the driver seat is a nice secure locker for valuables, with another lockable locker in the overhead racks, plus a first aid locker. 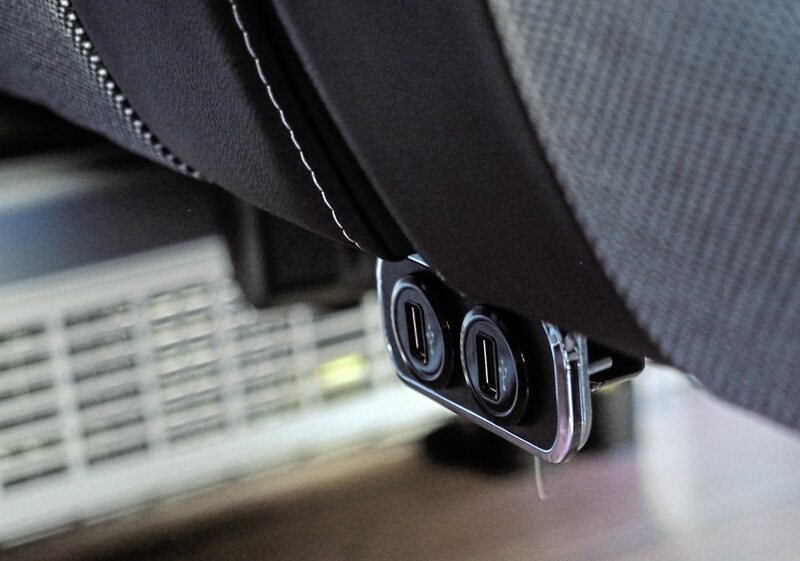 Additional storage includes a lidded cubby hole next to the driver seat beneath the gear selector console. 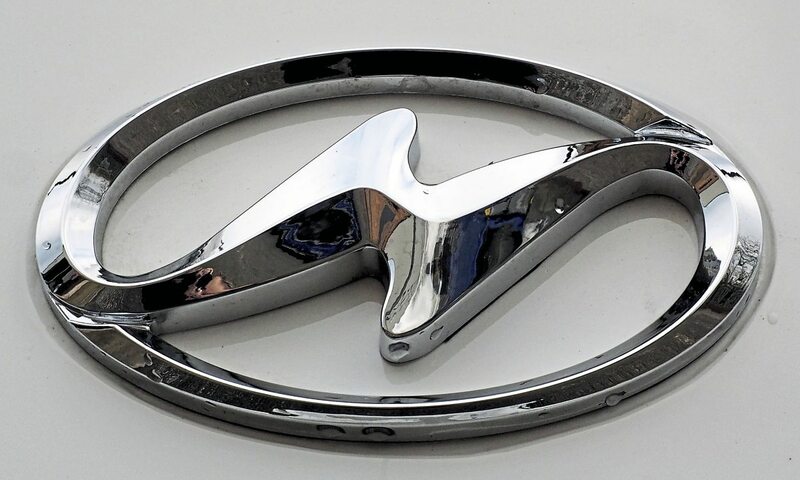 There’s a deep, half-moon shaped recess which we can only presume is a cup holder. We did not test whether cups will fit into it. The central, main status screen has the tachometer dial to its right, speedometer to the left. All are fully visible for the driver. The Actia screen set up we were presented with was, in the opinion of the test driver, cluttered with too much information. We did not explore its configurability, but we suspect it can be changed to show less information. The media screen to the left was in Chinese, which made finding the language setting to change it to English rather difficult. Our driver remarked that he’s prefer ‘standard’ Bosch media and, indeed, John Hill tells us that this is a change on its way for ensuing Super 9s, as is a redesigned dashboard. We look forward to seeing those changes. Within a few minutes of setting out on to Melton Mowbray’s streets, our test driver was impressed with the Super 9. Firstly, it’s nimble, with the proven combination of Cummins engine and EcoLife delivering brisk acceleration and smooth gearchanges. Secondly, the driver has a good view and consequent spatial awareness. Thirdly, the coach has a very good turning circle to help manage town driving situations. Out of town, on A roads, our test driver said the steering is perfectly weighted: “It’s not over sanitised, and you get good feedback,” he remarked. On the limiter on a dual carriageway – on a very windy day – there was a slight hint of steering vagueness. Nothing alarming but the test driver demonstrated that the vehicle was unresponsive to small steering inputs. Any experienced driver will, though, soon manage this, and it should not down-mark the otherwise excellent handling of this coach. One slight oddity of the Super 9 is the supplementary wiper blade on the offside. 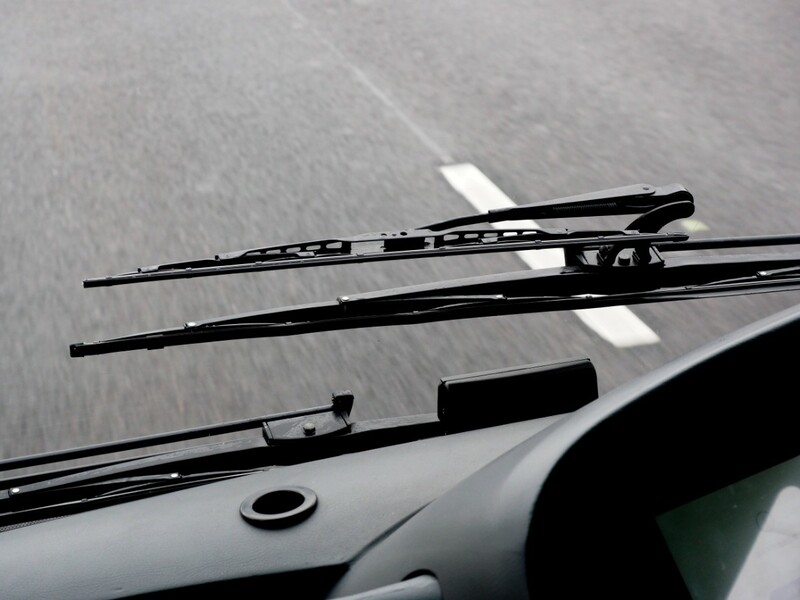 It may seem odd, but it’s there to ensure the wiper arm has the ‘reach’ to clear the screen in front of the mirror. This is possibly due to changes in spec to the original Chinese variant. At the limit, the engine was at around 1,300rpm, which suggests it should get good fuel economy. In service, we are told 15mpg is possible, which matches the fuel economy of the sector. The Super 9 has outstanding control of road noise. To all intents and purposes, there was none at all, and engine noise, too, was almost completely absent. The only noise intrusion was from the passenger door (which were were told was noted, and was due adjustment). The intarder did an excellent job on overrun, slowing the coach on inclines, and the service brakes were impressive. As with almost all road tests you will read, the coach was tested without a passenger load. The test driver says that, although this means performance expectations must be pegged back in ‘real life’ that any flaws will be evident loaded or unloaded in the coach of this type. It’s inevitable that comparisons will be drawn between the Super 9 and the Yutong TC9, not least because they share a similar Cummins/EcoLife driveline. I apologise in advance for confusing this road test with a mention of the competing product. 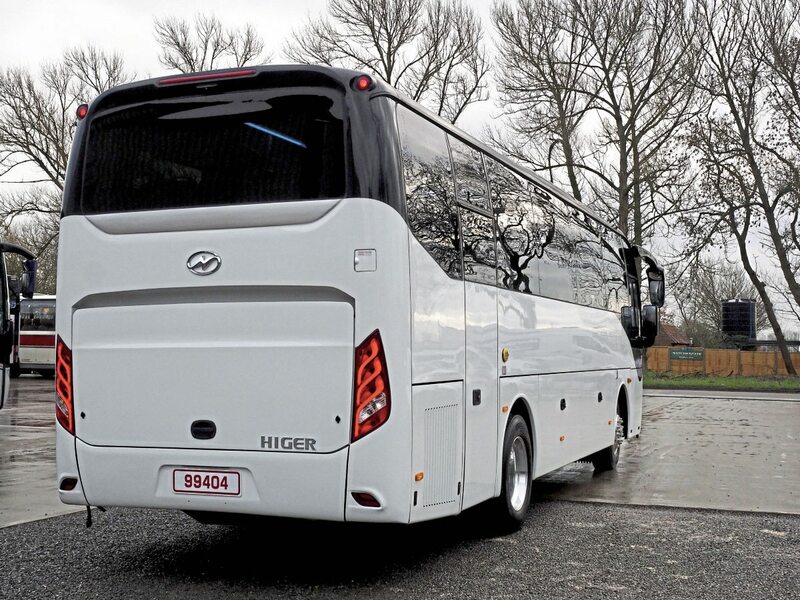 To its credit, the Higer manages to add two more seats into a coach which tips the scales at 9,860kg unladen (13,800GVW), versus the TC9’s 10,550kg (13,900GVW). The sign above the door calculates that the Super 9 can carry 590kg of luggage. The Higer Super 9 XL has all the building blocks of a very good midicoach indeed. The maturity of the design is evident in the outstanding quality of the bodywork and in the general behaviour of the coach on the road. 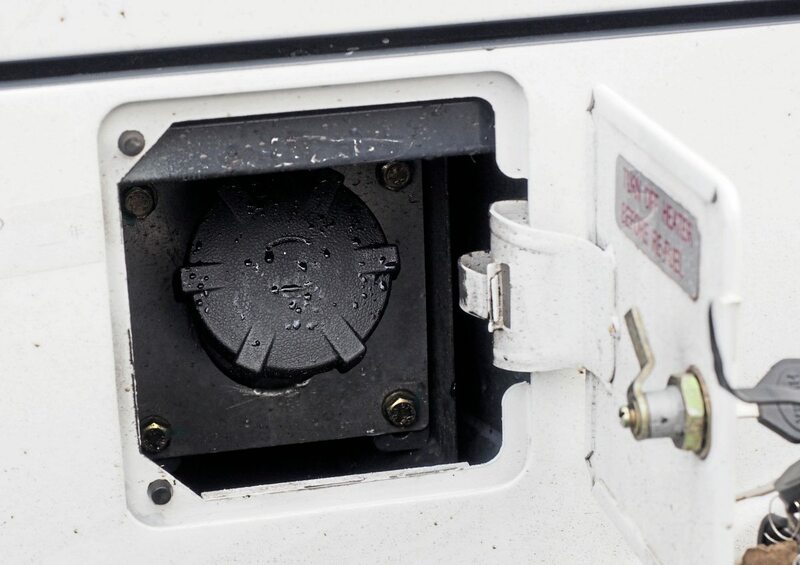 Few operators will have a problem with the Cummins power unit and the EcoLife gearbox, much less the ZF steering components and other familiar running gear. On its debut, the Super 9 met with a few criticisms which, to Harris’ great credit, were addressed; the small wheels, now upgraded to 22.5-inch, and areas of road noise control, now clearly and comprehensively conquered. The Super 9 XL is a serious contender in its sector and, by any measure, a good coach to drive with practical seating capacity and which has given great thought to passenger comfort. It’s still undergoing minor tweaks to specification, but it starts from a great baseline. So our criticisms are niggling. Some of the electronics on our test vehicle needed setting up properly, and in particular the Actia screen which we felt needed less clutter as its default. Likewise the media unit although, we are told, this will change to a Bosch unit soon. We’d welcome feedback on fuel economy from operators now running the Super 9. Rumour has it that one operator returned 18mpg on one journey; if the Super 9 comes even close to this in its Eco setting, it will tick a major box for buyers. It needs to, because the forecourt price of the Super 9 XL is £165,000. That’s a keen price, but not bargain basement. Nor should it be, because the Super 9 XL is well on its way to being a high-quality touring coach. 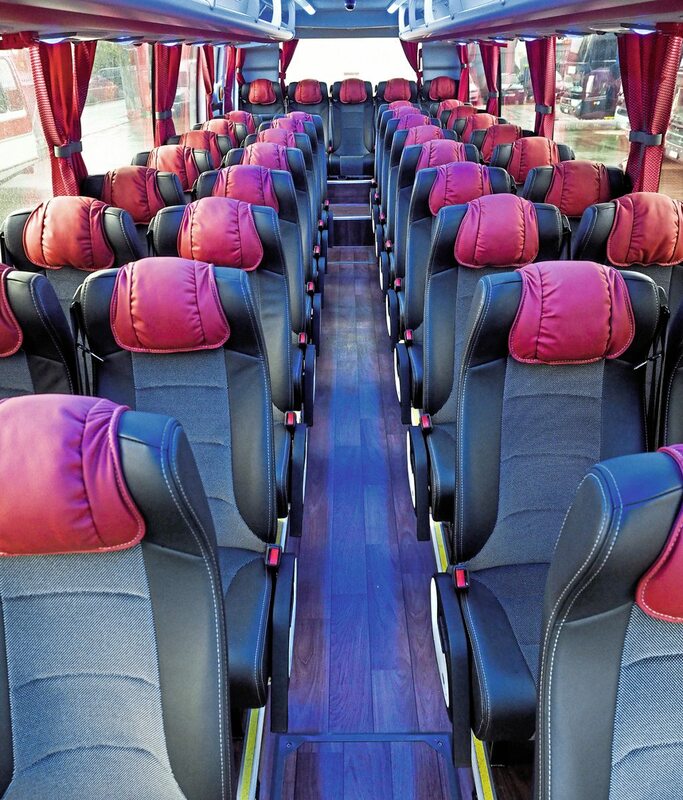 If you’re in the market for a 39-seater, you’d be daft not to have the Super 9 on your shopping list.